We had never given it much thought, but the United States Naval Academy offers some great gifts and opportunities to support the Midshipmen. Tours, the Gift Shop, USNA Museum Store, Drydock Restaurant, and their online presence all benefit the Mids directly. 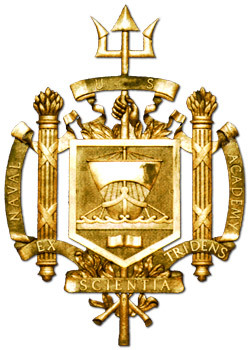 The Naval Academy Business Services Division (NABSD) is tasked to issue and maintain the Brigade of Midshipmen’s basic necessities, which is handled through the USNA Uniform Store, Midshipmen Store, Tailor, Cobbler and Barber Shops, Laundry facilities, Textbook Store, Steerage Restaurant, Midshipmen Computer Repair Center, etc. These are primarily Midshipmen-only services. So, NABSD is pretty much like the Student Union on other campuses (well, maybe not the Uniforms and Cobbler Shop part). NABSD is also authorized to operate for-profit businesses which are open to the public. These include the USNA Tours and Gift Shop (both housed in the Armel-Leftwich Visitor Center just inside the Randall St. gate), the USNA Museum Store, Drydock Restaurant in Dahlgren Hall, and the Gift Shop’s online presence, navyonline.com. However, neither NABSD nor USNA are authorized to keep the profits from these businesses. All profits generated from these businesses fund the Midshipmen Welfare Fund (MWF). The MWF supports Midshipmen extra-curricular, intramural, and Company activities, such as the holiday concerts you may have attended or off-Yard trips, like to the Kraft Fight Hunger Bowl in San Francisco later this month. In the truest sense, shopping at NABSD businesses is supporting the Brigade of Midshipmen. The USNA and their Midshipmen are all a part of life here in Annapolis and considering the sacrifice these young men and women will be making for or country, by all means, let’s shop local and support a Mid!